Objective The AAA+ ATPase Reptin is overexpressed in hepatocellular carcinoma and preclinical studies indicate that it could be a relevant therapeutic target. However, its physiological and pathophysiological roles in vivo remain unknown. This study aimed to determine the role of Reptin in mammalian adult liver. Design and results We generated an inducible liver-specific Reptin knockout (RepinLKO ) mouse model. Following Reptin invalidation, mice displayed decreased body and fat mass, hypoglycaemia and hypolipidaemia. This was associated with decreased hepatic mTOR protein abundance. Further experiments in primary hepatocytes demonstrated that Reptin maintains mTOR protein level through its ATPase activity. Unexpectedly, loss or inhibition of Reptin induced an opposite effect on mTORC1 and mTORC2 signalling, with: (1) strong inhibition of hepatic mTORC1 activity, likely responsible for the reduction of hepatocytes cell size, for decreased de novo lipogenesis and cholesterol transcriptional programmes and (2) enhancement of mTORC2 activity associated with inhibition of the gluconeogenesis transcriptional programme and hepatic glucose production. Consequently, the role of hepatic Reptin in the pathogenesis of insulin resistance (IR) and non-alcoholic fatty liver disease consecutive to a high-fat diet was investigated. We found that Reptin deletion completely rescued pathological phenotypes associated with IR, including glucose intolerance, hyperglycaemia, hyperlipidaemia and hepatic steatosis. Conclusion We show here that the AAA +ATPase Reptin is a regulator of mTOR signalling in the liver and global glucido-lipidic homeostasis. Inhibition of hepatic Reptin expression or activity represents a new therapeutic perspective for metabolic syndrome. Non-alcoholic fatty liver disease (NAFLD), linked to metabolic syndrome (MS), obesity and insulin resistance, is becoming one of the major causes of hepatocellular carcinoma. In addition to chromatin remodelling-related functions, Reptin plays a critical role in the stabilisation of phosphatidylinositol 3-kinase-related protein kinase family members, like the mTOR kinase. Reptin ATPase activity is required for controlling mTOR protein level in the liver. Hepatic Reptin inhibition (expression or activity) impairs mTORC1 signalling and lipogenic transcriptional programme, but constitutively activates mTORC2 signalling and improves insulin sensitivity by inhibiting hepatic gluconeogenesis. 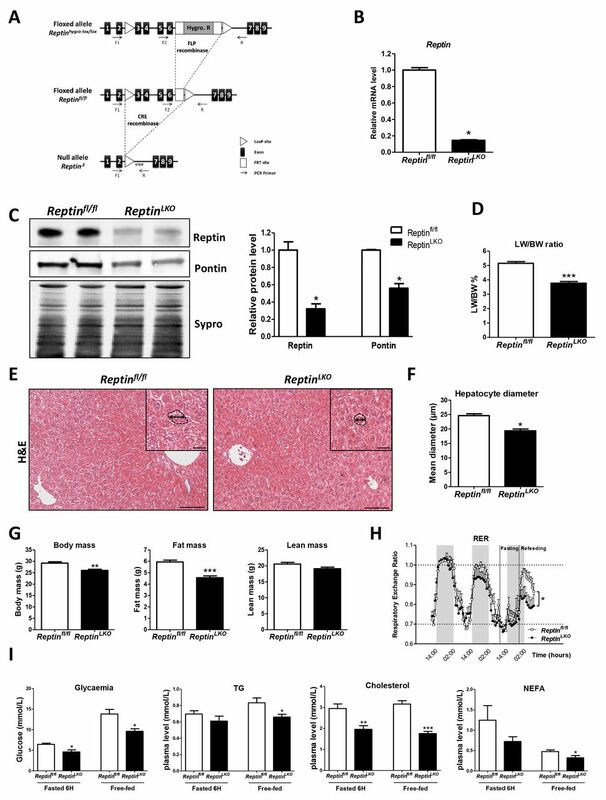 Loss of Reptin in the liver is sufficient to rescue high-fat diet-associated metabolic phenotypes. Inhibiting Reptin ATPase activity might represent a therapeutic strategy in MS and NAFLD. Sedentary life style and excessive consumption of energy-rich food have led to a worldwide obesity epidemic associated with an increased prevalence of metabolic syndrome (MS), type 2 diabetes mellitus (T2DM) and non-alcoholic fatty liver disease (NAFLD).1 Insulin resistance (IR) is a common feature in patients with T2DM and/or NAFLD. In the liver, IR diminishes insulin-mediated inhibition of gluconeogenesis, resulting in hyperglycaemia. In addition, increased lipolysis in adipocytes and fatty acid uptake in the hepatocytes combined with increased de novo liver lipogenesis lead to accumulation of lipid droplets or steatosis. Lipid-induced toxicity eventually causes hepatic lesions that can progress to steatohepatitis, liver cirrhosis and hepatocellular carcinoma (HCC). IR is suspected to be one of the causes of the MS-related cancer risk2 and obese subjects are at increased risk of dying from HCC.3 Therefore, aberrant energy homeostasis is associated with metabolic diseases and cancer and identifying therapeutic targets to mitigate the MS remains an important challenge. Reptin (also called RUVBL2) belongs to the AAA+ (ATPases associated with diverse cellular activities) superfamily of ATPases, characterised by the presence of two highly conserved domains, the Walker A and B motifs responsible for nucleotide binding and hydrolysis, respectively. Reptin is overexpressed in 75% of HCC and it is associated with poor prognosis.4 Interfering with Reptin expression results in reduced tumour cell growth in vitro and tumour regression in mice xenografts.4 5 Reptin and its paralogue Pontin or RUVBL1 usually form homo-hexameric or hetero-hexameric ring structures or dodecamers in yeast and human.6–9 ATPase activity is stronger when Reptin and Pontin are in complex than when they are alone.6 10 Importantly, inhibition of ATPase activity using Reptin mutants is sufficient to induce the anticancer effects observed on Reptin silencing in HCC.11 Reptin has been associated with many biological processes (for review12), such as chromatin remodelling, transcription regulation and stabilisation of all members of the phosphatidylinositol 3-kinase-related protein kinase (PIKK) family, including mTOR (mechanistic target of rapamycin). Silencing any one of the members of the R2TP complex abolishes downstream mTOR signalling.13 However, the role of Reptin has so far never been explored in an intact mammalian organism in vivo. To elucidate the role of Reptin in the liver, we used two complementary approaches: (1) we generated a liver-specific inducible knockout mouse model to determine the consequences of loss of Reptin in the adult liver within the whole organism; (2) we used a pharmacological inhibitor of Reptin/Pontin ATPase complex in primary hepatocytes to address whether the effects of loss of Reptin are ATPase-dependent and if they are cell autonomous. We show that the ATPase activity of Reptin is required for regulating mTOR protein abundance in hepatocytes. Deletion of hepatic Reptin affects glucose and lipid homeostasis with opposite effects on mTORC1 and mTORC2 activity in the adult liver. Furthermore, hepatic Reptin deletion protected mice from high-fat diet (HFD)-induced glucose intolerance, hepatic steatosis and hyperlipidaemia. Thus, our findings identify Reptin as a critical regulator of whole body lipid and glucose homeostasis with a bimodal action on hepatic mTOR signalling. Acute loss of Reptin in the liver affects energy body homeostasis. (A) Schematic representation of the strategy used to target Reptin/RUVBL2 gene. (B) Relative mRNA and (C) immunoblotting and relative Reptin and Pontin protein levels from whole liver extracts of Reptinfl/fl and ReptinLKO mice at D15 post-TAM (n=5). (D) LW/BW ratio in Reptinfl/fl and ReptinLKO mice (n=8 per group). (E) Representative pictures of H&E staining with magnified inserts of liver sections from Reptinfl/fl and ReptinLKO mice at D15 post-TAM. Scale bars, 100 µm and 25 µm, respectively. (F) Hepatocyte mean diameter measurement of 200 hepatocytes counted ±SEM in control and Knock-out liver sections (n=3). (G) Total body weight, fat mass and lean mass measured by echoMRI in Reptinfl/fl and ReptinLKO mice (n=6). (H) Hourly respiratory exchange ratio analysis from Reptinfl/fl and ReptinLKO mice in free-fed state then during fasting and refeeding as indicated (n=6). (I) Glycaemia and plasma TG, cholesterol and free fatty acids levels in Reptinfl/fl and ReptinLKO mice in free-fed state (n=12) or after 6 hours of fasting (n=9). All graphs represent mean±SEM and significance is indicated as follows: *p≤0.05, **p≤0.01, ***p≤0.001, ns (not significant). D15 post-TAM, 15 days post-tamoxifen; LW/BW, liver weight/body weight; NEFA, non-esterified fatty acids; TG, triglycerides. Deletion of Reptin resulted in decreased liver/body weight (LW/BW) ratio (figure 1D). No liver toxicity was observed as revealed by H&E staining of liver sections (figure 1E) and by aspartate aminotransferase (AST) and alanine amino-transferase (ALT) serum concentrations (see online supplementary figure 1C). Moreover, there was no detectable apoptosis or proliferation (see online supplementary figure 1D). Notably, Knock-out hepatocytes were significantly smaller than control hepatocytes (figure 1E-F). In contrast with control mice, ReptinLKO mice did not gain weight at day 14 post-tamoxifen injection (D14) and they began losing weight at D21 with a maximum at D30 (see online supplementary figure 1E). However, they then started to regain weight and this was associated with an increase of Reptin mRNA level, suggesting that the rescue of the weight phenotype was due to the recovery of non-recombined hepatocytes (see online supplementary figure 1F). We thus decided to study the effect of an acute deletion of Reptin in ReptinLKO mice between D15 and D21 post-tamoxifen injections. The decreased body weight in ReptinLKO mice was associated with a significant lower fat mass, with no difference in lean mass, as shown by body composition analysis (figure 1G). No significant difference in total ad libitum food intake was observed between D15 and D18 (see online supplementary figure 1G). However, mutant mice showed a decreased meal size, compensated by a higher meal frequency than control mice (see online supplementary figure 1H). The respiratory exchange ratio was significantly decreased in ReptinLKO , particularly during the refeeding period following a short fast (figure 1H). Accordingly, food intake during refeeding was reduced (see online supplementary figure 1I) and accompanied by increased use of lipids as fuel (see online supplementary figure 1J,K). We thus examined whether loss of Reptin in the hepatocytes affected global energy metabolism. Glycaemia and plasma triglycerides (TG), non-esterified fatty acids (NEFA) and cholesterol were all significantly reduced in ReptinLKO mice at D15 after tamoxifen injection compared with controls, whether in the fasted or ad libitum fed state (figure 1I). Thus, hepatocyte-specific deletion of Reptin in adult liver leads to a reduction of LW/BW ratio associated with a decrease in hepatocyte cell size, body and fat mass and in systemic glucose and lipid levels. mTOR signalling regulates glucido-lipidic metabolism in the liver with effects on the whole-body energy homeostasis.16–18 Since Reptin functions as a chaperone for PIKK family members in vitro,13 we tested whether defects in ReptinLKO mice were related to abnormal mTOR signalling. mTOR protein expression was decreased up to fivefold in Knock-out liver while mTOR mRNA level was slightly increased (figure 2A,B). We confirmed that the effect of Reptin loss on mTOR abundance was cell-autonomous by inducing Reptin knockout via adenoviral-mediated expression of Cre recombinase in Reptinfl/fl hepatocytes (see online supplementary figure 2A–C). We next tested if mTOR regulation by Reptin was dependent on Reptin/Pontin ATPase activity using a pyrazolone derivative inhibitor of the ATPase activity of the Reptin/Pontin complex (a generous gift from Daiichi-Sankyo, Japan,19 compound #40, R1 is a methyl group, see online supplementary figure 2D–F). Primary hepatocytes cultured with the Reptin/Pontin ATPase inhibitor showed a decrease in mTOR protein level with no change in mTOR mRNA level (figure 2C–E). Reptin AAA+ ATPase controls hepatic mTOR protein level. (A) Immunoblot of Reptin and mTOR with relative protein levels and (B) relative mRNA expression of mTOR in liver extracts from Reptinfl/fl and ReptinLKO mice at D15 post-TAM (n=3). (C) Immunoblot of Reptin and mTOR with relative protein levels in mouse primary hepatocytes extracts after treatment with Reptin/Pontin ATPase inhibitor (1 µM) 96 hours (n=3). Asterisk indicates an aspecific band and Sypro staining was used for normalisation on total proteins. (D) mTOR immunofluorescence in mouse primary hepatocytes treated with Reptin/Pontin ATPase inhibitor for 96 hours. Scale bar, 20 µm. (E) Relative mTOR mRNA level in vehicle or inhibitor-treated hepatocytes (n=3). All graphs represent mean±SEM and significance is indicated as follows: *p≤0.05. Thus, Reptin regulates mTOR hepatocytes protein level in a Reptin/Pontin ATPase activity-dependent manner. To further define the role of Reptin on mTOR-dependent control of liver metabolism, we investigated the consequences of Reptin deletion in hepatocytes in the fasted and refed state. Insulin and glucose levels increased similarly in control and ReptinLKO -refed mice (see online supplementary figure 3A). In Reptin Knock-out livers, AKT phosphorylation on Thr308 and Ser473 was strongly increased both in fasted and refed conditions. Accordingly, the phosphorylation of the AKT target FOXO1/3 was also increased in the refed state (figure 3A and see online supplementary figure 3B). Similarly, AKT phosphorylation (T308 and S473) was enhanced in response to insulin in hepatocytes cultured with the Reptin/Pontin ATPase inhibitor (figure 3B and see online supplementary figure 3C). As expected, insulin increased the inhibitory phosphorylation of IRS1 S639, but this effect was abolished in hepatocytes treated with the ATPase inhibitor (figure 3B and see online supplementary figure 3C). These data suggest that increased insulin-induced AKT signalling on Reptin inhibition is linked to the relief of the mTORC1 inhibitory feedback on IRS1. Acute loss of Reptin impairs mTORC1 signalling and lipid metabolism but enhances mTORC2/AKT signalling. (A) Representative immunoblotting of AKT, mTORC1 and mTORC2 signalling in liver extracts from Reptinfl/fl and ReptinLKO mice in fasted and refed state. (B) Representative immunoblotting of phospho-AKT, IRSp639 and IRS1 total in mouse primary hepatocytes extracts treated with Reptin/Pontin ATPase inhibitor (1 µM) or vehicle and simulated by insulin 10 nM for 0, 5, 15 and 30 min (n=3). (C) GSEA of downregulated genes in livers from refed ReptinLK O mice demonstrating specific enrichment of genes involved in fatty acid metabolism, cholesterol homeostasis and mTORC1 signalling. (D) Relative mRNA expression of Reptin, SREBF1, GCK, FASN, SREBF2 and HMGCR in liver extracts from Reptinfl/fl and ReptinLKO mice in fasted and refed state (n=6, from two independent experiments). All graphs represent mean ±SEM and significance is indicated as follows: *p≤0.05, **p≤0.01, ***p≤0.001, ns (not significant). (E) Relative mRNA expression of de novo lipogenesis and cholesterol synthesis genes in mouse primary hepatocytes extracts stimulated for 24 hours with 5 mM (G5) or with 25 mM glucose and 100 nM insulin (G25i) after treatment with 1 µM Reptin ATPase inhibitor or control-Vehicle (n=3). All graphs represent mean±SEM; significance versus 5 mM low glucose control (G5-Vehicle) is indicated as follows: *p≤0.05, **p≤0.01, ***p≤0.001 and significance versus 25 mM high glucose +100 nM insulin control (G25i-Vehicle) is indicated as follows: $p≤0.05, $$p≤0.01, $$$p≤0.001. GSEA, gene set enrichment analysis; NES, normalised enrichment score. Because AKT phosphorylation on Ser473 requires mTORC2 activity, we analysed in more detail mTORC1 and mTORC2 signalling. We observed a strong decrease in mTORC1 signalling. 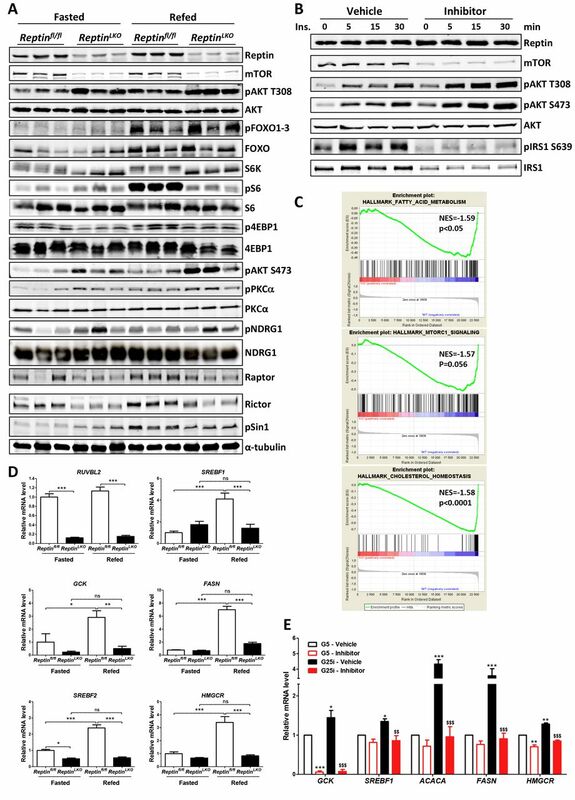 Specifically, the induction of the phosphorylation of mTORC1 targets 4EBP1, S6K and of its substrate S6 was highly inhibited in refed Reptin Knock-out livers (figure 3A and see online supplementary figure 3B). Paradoxically, the phosphorylation of the mTORC2 substrates AKT (Ser473), PKCα and NDRG1 was increased in ReptinKO livers indicating an activation of mTORC2 signalling both in fed and fasted conditions (figure 3A and supplementary figure 3B). Importantly, S6K-mediated inhibitory feedbacks on mTORC220–23 were also affected, as shown by the absence of phosphorylation of mSIN1 and Rictor (revealed by absence of mobility shift of Rictor on Western blot) in Reptin Knock-out livers on refeeding compared with controls (figure 3A and see online supplementary figure 3B). Thus, inhibition of Reptin impairs mTORC1 but enhances mTORC2 signalling in fasted and refed conditions. Global gene expression profile analysis identified 563 upregulated and 503 downregulated genes in Reptin Knock-out liver extracts from refed mice (FC >1.2 and p value<0.05, see online supplementary tables 1–3). Gene ontology (GO) analysis revealed a significant decrease in the biological processes of the GO categories ‘lipid metabolism’, ‘cholesterol metabolism’ and ‘carbohydrate metabolism’ and significant increase of gene sets involved in catabolic processes (table 1). Gene set enrichment analysis highlighted specific signatures associated with downregulation of fatty acid and cholesterol metabolism and mTORC1 signalling (figure 3C and see online supplementary tables 1–3). In refed Knock-out liver, real-time qPCR confirmed the lack of induction of the lipogenic transcriptional factor gene SREBF1 and its targets glucokinase (GCK), fatty-acyl synthase (FASN), together with SREBF2 and its target involved in cholesterol synthesis HMGCR (figure 3D). Similarly, Reptin ATPase inhibitor-treated hepatocytes displayed a complete lack of induction of glycolytic (GCK), de novo lipogenesis (SREBF1, ACACA, FASN) and cholesterol synthesis (HMGCR) gene sets expression in response to glucose/insulin stimulation (G25i, Glucose 25 mM, Insulin 100 nM) compared with basal glucose 5 mM (figure 3E). Conversely, adenovirus-mediated expression of active SREBP1c24 was able to reactivate FASN expression (see online supplementary figure 3D). Altogether these data show that loss of Reptin leads to constitutive activation of insulin/AKT signalling associated with an opposite regulation of mTORC1 and mTORC2 signalling. Blockade of mTORC1-mediated signalling is linked to inhibition of de novo lipogenesis and cholesterol transcriptional programme consistent with hypolipidaemia and hypocholesterolaemia described in figure 1I. Constitutive activation of mTORC2/AKT/FOXO should impact gluconeogenesis and lead to decreased hepatic glucose production (HGP) in ReptinLKO mice. Indeed, induction of PEPCK and G6PC expression was significantly decreased in ATPase inhibitor-treated hepatocytes (figure 4A-B) in response to glucagon, while the insulin-mediated inhibition of these genes was further enhanced (see online supplementary figure 4A,B). HGP was strongly impaired in ReptinLKO mice as shown by the pyruvate tolerance test (figure 4C). ReptinLKO mice remained hypoglycaemic over the 2 hours time course of the test, despite the supply of pyruvate as a gluconeogenic substrate. Consistent with AKT/FOXO hyperphosphorylation, nuclear accumulation of the gluconeogenic transcription factor Foxo1 was greatly reduced in Reptin Knock-out livers (figure 4D). Moreover, ReptinLKO mice displayed a significant fasting hypoglycaemia (figure 4E). Finally, we demonstrated that inhibition of HGP in ReptinLKO mice was associated with increased glucose tolerance following a bolus of glucose, given either intraperitoneally or by oral gavage (figure 4F and see online supplementary figure 4C). Concurrently, insulin plasma levels were comparable in ReptinLKO and control mice (figure 4G). Loss of Reptin in the liver attenuates HGP and increases glucose tolerance. (A) Representative immunoblotting of mTOR and pAKT Ser473 and pFOXO1-3 (B) relative mRNA levels of PEPCK and G6PC in primary hepatocytes treated with Reptin/Pontin ATPase inhibitor (1 uM) or vehicle (Dimethyl Sulfoxide) stimulated with Glucagon (100 nM) for 6 hours (n=4). (C) HGP analysis by PTT 2 g/kg with quantification of the area under the curve calculated from baseline y=50 from Reptinfl/fl and ReptinLKO mice after 10 hours of fasting (n=11). (D) Immunoblotting and relative protein expression of FOXO1 in liver nuclear extracts from Reptinfl/fl and ReptinLKO mice after 6 hours fasting (n=3). H1 was used for normalisation of nuclear proteins. (E) Glycaemia of Reptinfl/fl and ReptinLKO mice during fasting. (F) Intraperitoneal GTT (1 g/kg) with quantification of the area under the curve from Reptinfl/fl and ReptinLKO mice after 8 hours of fasting (n=7). (G) Plasma insulin levels from Reptinfl/fl and ReptinLKO mice at time 0 and 20 min measured at T0 and 20 min after glucose injection (n=7). All graphs represent mean±SEM and significance is indicated as follows: *p≤0.05, **p≤0.01, ***p≤0.001, ns (not significant). GTT, glucose tolerance test; HGP, hepatic glucose production; PTT, pyruvate tolerance test. These data indicate that liver-specific Knock-out of Reptin yields increased glucose tolerance with robust inhibition of HGP. Finally, the dual effect of Reptin inhibition on insulin signalling and mTORC1 and mTORC2 signalling prompted us to test the metabolic consequences of liver Reptin knockout in a model of obesity and IR induced by HFD. Reptinfl/fl and Alb-CreERT2-Reptinfl/fl mice were either fed a standard diet (SD) or a HFD for 12 weeks to allow IR development (figure 5A and see online supplementary figure 5A). At week 12, all mice fed a HFD had gained significantly more weight than control ones (figure 5B). IR was documented in HFD mice using a GTT (see online supplementary figure 5A). Reptin invalidation was then induced with tamoxifen. Mice were kept for 18 more days (up to week 14) on a HFD (figure 5A). Despite being continuously fed a HFD, ReptinLKO mice started to lose weight 14 days post tamoxifen injection (W14 post-HFD) (figure 5B and see online supplementary figure 5B). Glucose tolerance of ReptinLKO mice was completely restored and did not differ from that of SD Reptinfl/fl fed mice (figure 5C). Moreover, their HGP was strongly inhibited (see online supplementary figure 5C) and was paralleled with increased AKT/FOXO1 phosphorylation (see online supplementary figure 5D). Insulin sensitivity was restored in HFD-ReptinLKO mice, only 2 weeks after Reptin invalidation, as reflected by the significant reduction of the Homeostasis model assessment of insulin resistance index (HOMA-IR) (figure 5D). We also examined the effect of Reptin deficiency on liver steatosis. As expected, H&E staining of liver sections revealed a macrovesicular steatosis in Reptinfl/fl mice fed a HFD (figure 5E). Remarkably, lipid droplets were very rare in Reptin-deficient livers and this was confirmed by hepatic TG measurements (figure 5F). Likewise, there was a large reduction of plasma TG, cholesterol and free fatty acids levels in HFD-fed ReptinLKO mice (figure 5G). All these results have been also observed in an independent experiment, as soon as 10 days following Reptin deletion induced using an AAV-mediated expression of Cre recombinase in Reptinfl/fl mice fed a HFD for 8 weeks (see online supplementary figure 5E–H). Finally, we used an in vitro surrogate model of IR to assess the role of Reptin ATPase activity and to confirm that it acted also in a cell-autonomous way in this setting. Reptinfl/fl hepatocytes were cultured with palmitate to induce a lipotoxic-induced IR, evidenced by the decreased phosphorylation of AKT in response to insulin (figure 5H). Inhibition of Reptin ATPase activity rescued AKT phosphorylation back to palmitate-free control, suggesting that interfering with Reptin ATPase activity is sufficient to mitigate hepatic insulin sensitivity under IR conditions. 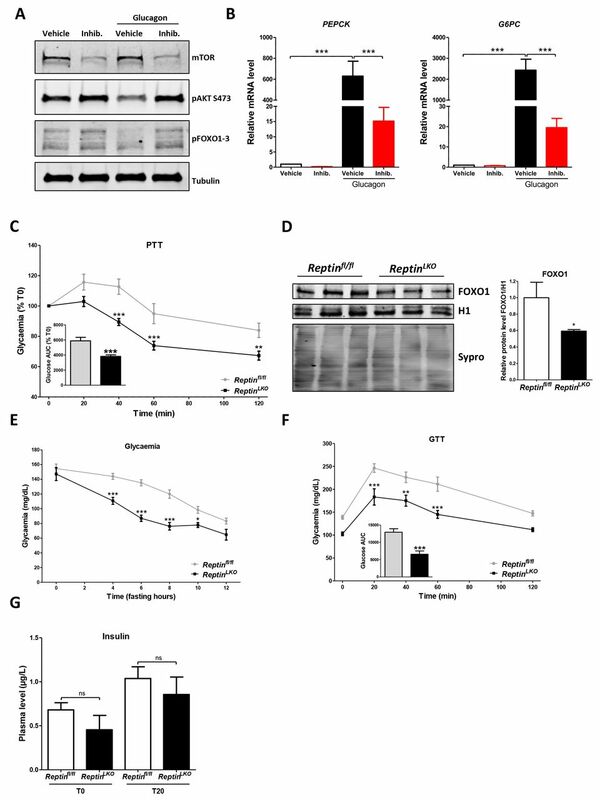 Loss of Reptin rescues HFD-induced IR, hepatic steatosis, hyperglycaemia and hyperlipidaemia. (A) Experimental strategy for Reptin deletion in Reptinlox/lox-AlbCreERT2 model with 14 weeks HFD-induced IR. Three groups: SD (n=3), HFD-Reptinfl/fl (n=3) and HFD-ReptinLKO (n=5). (B) Body weight gain week-by-week calculation from SD, HFD-Reptinfl/fl and HFD-ReptinLKO during the experiment. (C) Oral glucose tolerance test (1 g/kg) after 12 hours of fasting with quantification of the area under the curve from SD, HFD-Reptinfl/fl and HFD-ReptinLKO mice 18 days after Reptin deletion in fed state. (D) IR index Homeostasis model assessment of insulin resistance (HOMA-IR) calculation from SD, HFD-Reptinfl/fl and HFD-ReptinLKO mice 14 days after Reptin deletion. (E) Representative pictures of H&E staining of liver sections from SD, HFD-Reptinfl/fl and HFD-ReptinLKO 18 days after Reptin deletion. Scale bar, 100 µm. (F) Measurement of liver TG contents and (G) plasma TG, cholesterol and free fatty acids measurements from SD, HFD-Reptinfl/fl and HFD-ReptinLKO mice 18 days after Reptin deletion in fed state. (H) Representative immunoblotting of AKT signalling in mouse primary hepatocytes extracts after treatment with 0.48 mM palmitate and 1 µM Reptin ATPase inhibitor and stimulated by 10 nM insulin for 15 min (n=3). All graphs represent mean±SEM and significance is indicated as follows: *p≤0.05, **p≤0.01, ***p≤0.001, ns (not significant). HFD, high-fat diet; IR, insulin resistance; SD, standard diet; TG, triglycerides. Altogether Reptin inhibition increases insulin/AKT signalling and improves glucose metabolism with inhibition of liver steatosis. Hence, Reptin inhibition in the liver is sufficient to restore glucose tolerance and lipid homeostasis on HFD-induced IR in vivo (figure 6). Interfering with hepatic Reptin leads to mTORC1 and mTORC2 uncoupling associated with improved lipid and glucose metabolism. TG, triglycerides. We show that Reptin is required for maintaining mTOR protein level in the adult liver. Inhibition of Reptin leads to opposite effects on mTOR signalling: (1) blockade of mTORC1 signalling and de novo lipogenesis and cholesterol transcriptional programme and (2) constitutive activation of mTORC2 signalling accompanied by enhanced inhibition of gluconeogenesis and HGP. In addition, Reptin deletion in the liver rescues HFD-induced IR, glucose intolerance, hepatic steatosis and hyperlipidaemia, suggesting that inhibiting Reptin expression or activity represents a new therapeutic perspective for the MS.
Our results point out a crucial role for Reptin in regulating mTOR protein level and mTOR-associated functions in the liver in vivo. We find that the abundance of mTOR protein in the liver is regulated by Reptin at a post-translational level in a Reptin/Pontin ATPase activity-dependent manner. Although similar results have been published previously in cell lines and shown to depend on the role of Reptin within the R2TP complex,13 25 26 it is the first time that Reptin is shown to regulate mTOR abundance in vivo in an intact organism. Remarkably, we demonstrate that it impacts the control of metabolic processes. Inhibiting Reptin expression or ATPase activity in hepatocytes yielded a strong inhibition of mTORC1 signalling. First, Reptin Knock-out hepatocytes displayed reduced cell size, a hallmark of reduced mTORC1 activity.27–29 Second, de novo lipogenesis and cholesterol synthesis transcriptional programme were strongly affected in Knock-out livers, particularly on refeeding. Reptin inhibition led to a downregulation of SREBP transcriptional factors and target genes as also seen on treatment with the mTOR inhibitor rapamycin or in Raptor/mTORC1 Knock-out livers.30–32 Re-expression of active SREBP1c24 was sufficient to reactivate FASN expression in inhibitor-treated hepatocytes. Of note, genetic studies revealed that mTORC1 activation is not sufficient to stimulate hepatic SREBP1c in the absence of AKT signalling.33–37 In Reptin Knock-out livers, SREBP1c was inhibited despite the AKT-dependent INSIG2A downregulation (see online supplementary figure S6A). This suggests that, reciprocally, AKT is not sufficient to induce lipid synthesis in the absence of active mTORC1. 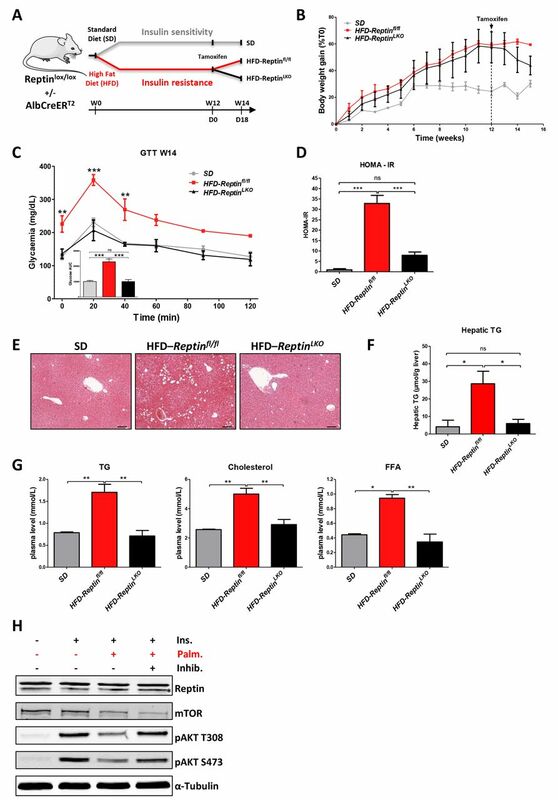 Since de novo lipogenesis is responsible for accumulation of up to 30% of the TG content in the livers of patients with NAFLD,38 mTORC1/SREBP blockade on Reptin deficiency may explain the improvement of hepatic lipid content in mice under HFD. An additional mechanism for improved lipid metabolism is that loss of Reptin affects the normal suppression of β-oxidation,39 as suggested by our experiments in indirect calorimetry cages and increased levels of β-hydroxybutyrate in the fed state (see online supplementary figure S1K). 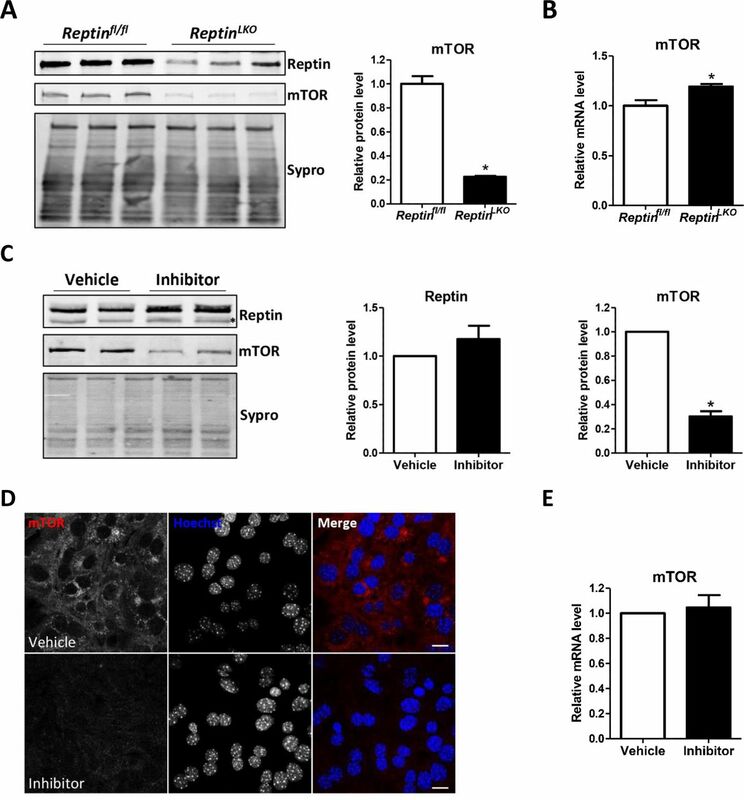 Despite the decrease in total mTOR abundance, Reptin inhibition is associated with an apparent constitutive hyperactivation of mTORC2 signalling as seen notably by the hyperphosphorylation of AKT on Ser473. Loss of Reptin increased the sensitivity to insulin-mediated inhibition of gluconeogenesis and fasting hypoglycaemia. This may be explained by a decreased activity of FOXO transcriptional factor in Knock-out livers resulting in a strong decrease in the expression of PEPCK and G6PC, as observed in hepatocytes treated with the Reptin/Pontin ATPase inhibitor even in the presence of glucagon. Importantly, loss of Reptin significantly improved glucose tolerance under IR. In contrast, chronic administration of rapamycin36 or knocking out hepatic Rictor,34 35 37 which disrupts mTORC2, result in IR and glucose intolerance due to constitutively active gluconeogenesis. These results suggest that mTORC1 inhibition with concurrent mTORC2 activation may be beneficial to improve glucose and lipid metabolism in IR. Since Reptin interacts with several transcriptional factors,41–44 further analyses are needed to determine whether some aspects of Reptin Knock-out livers relies on this function and especially whether metabolic function of Reptin/and Pontin influence its role in gene transcription. 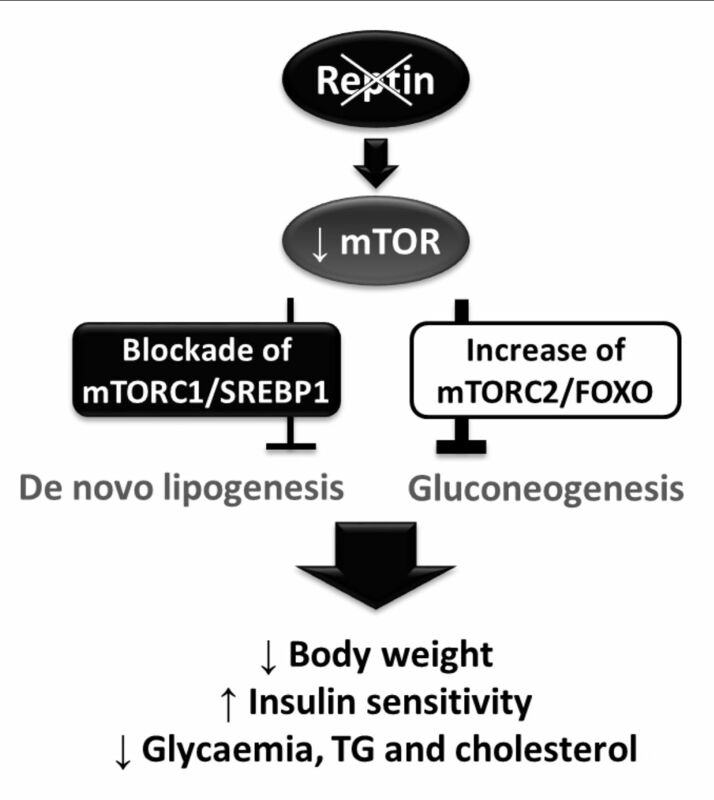 The dual effect of the loss of Reptin on mTOR signalling was associated with improved global glucose and lipid metabolism under the pathological condition of diet-induced IR in mice. Loss of Reptin was able to rescue the selective IR characterised by increased mTORC1-dependent lipid synthesis but decreased insulin-mediated inhibition of mTORC2/AKT/FOXO-controlled gluconeogenesis and HGP.45 This suggests that Reptin is able to regulate insulin sensitivity by mitigating mTOR signalling. Accordingly, a recent study identified Reptin-Pontin complexes as positive regulators of insulin signalling network.46 Finally, we found that Reptin is overexpressed in the liver of obese and insulin-resistant mice, Db/Db and Ob/Ob mice with hyperglycaemia (see online supplementary figure 6I–K) and in a small series of obese human subjects with T2D47 that we reanalysed (see online supplementary figure 6L). This is a further suggestion of the relevance of our findings for metabolic liver disease. In summary, our results show that Reptin is a fine-tuner of mTOR signalling in the liver. Since Reptin/Pontin ATPase activity is required for modulating mTOR protein level, insulin response and maintaining glucido-lipidic homeostasis, inhibiting Reptin might represent a potential therapeutic strategy in MS and NAFLD. Finally, this model may provide a unique context for differentially modulating mTORC1 and mTORC2 activities and to better understand the consequences of therapeutically targeting the mTOR pathway in cancer and other diseases. C57Bl/6J/Sv129 Reptinfl/fl mice were generated in collaboration with Cochin institute (see online supplementary information) and crossed with Alb-CreERT2 (C57Bl/6J)14 to obtain a hepatocyte-specific model for Reptin invalidation inducible by tamoxifen (figure 1A and online supplementary table 5). Mice were housed in pathogen-free conditions, in colony and temperature controlled environment with a 18:00–06:00 hours dark cycle. Experiments were carried out using littermate male mice of 8–12 weeks of age and between D15 and D18 post-tamoxifen injection (1.5 mg at D0 and D2). For ‘fed’ conditions, mice were sacrificed between 09:00 and 11:00 hours; For fasting/refed experiment, mice were fasted overnight (13 hours); for refed conditions, mice were fasted for 13 hours then fed a chow diet with 20% glucose water for 6 hours (from 15:00 to 09:00 hours). Mice were then sacrificed. Liver tissues were frozen in nitrogen liquid and stored at −80°C. Indirect calorimetry, feeding behaviour analyses were performed using the Phenomaster system (TSE systems, Bad Homburg, Germany).48 Experiments were performed during a free feeding period (48 hours) and after an automatic fasting/re-feeding challenge (13 hours/10 hours, fasting starting 5 hours before the onset of the dark). Body mass composition was analysed using the Echo Medical Systems EchoMRI 900 (EchoMedical Systems, Houston, Texas, USA). For HFD experiments, 8-week-old Reptinlox/lox (Reptinfl/fl ) and Alb-CreERT2 - Reptinlox/lox (ReptinLKO ) mice were fed for 12 weeks with HFD (Western diet, TD.88137, Harlan/Envigo). At week 12, mice received two injections of tamoxifen (D0 and D2). Mice were kept under HFD and sacrificed at D18 post-injection. Glucose tolerance tests (GTTs) were performed either by gavage or by intraperitoneal injection of glucose (1 g/kg) after 8 hours fasting (or 12 hours on HFD mice).49 Pyruvate and insulin tolerance tests were performed by intraperitoneal injection of pyruvate (2 g/kg) or insulin (0.75 U/kg) after 10 or 6 hours fasting, respectively. Blood glucose from the tail vein was determined using Accu-Check Performa glucometer (Roche). To inhibit Reptin/Pontin ATPase activity, hepatocytes were incubated with a Reptin-Pontin ATPase inhibitor ((1R,3S)−3-[5-(5-chloro-2-ethoxyphenyl)-1,3,4-oxadiazol-2-yl]-N-(1,5-dimethyl-3-oxo-2-phenyl-2,3-dihydro-1H-pyrazol-4-yl) cyclohexane carboxamide; 1 µM in Dimethyl Sulfoxide 0.1% provided by Daiichi-Sankyo (Japan).19 Vehicle Dimethyl Sulfoxide was used as control. To stimulate insulin signalling, hepatocytes were stimulated with insulin 10 nM, 96 hours after Reptin inhibition. For glucose and insulin stimulation, 72 hours after deletion or inhibition of Reptin, hepatocytes were cultured either with glucose 5 mM or glucose 25 mM and insulin 100 nM for 24 hours. For glucagon stimulation, hepatocytes were treated with glucagon (100nM) for 6 hours prior to harvesting. For palmitate treatment, hepatocytes were treated with 0.48 mM palmitate and 5% fatty acids-free BSA and Reptin was deleted or inhibited at the same time. Insulin plasma levels were determined using mouse insulin ELISA kit (Mercodia). Plasma glucose, TG, free fatty acids, cholesterol, Alanine amino-transferase and Aspartate amino-transferase levels were measured by the Bichat Biochemistry platform (Paris). Liver samples were crushed in ammonium acetate 180 mM pH8. Then TG were extracted in chloroform/methanol (17:1). TG concentration was measured using a colorimetric assay (Diasys). Protein extracts were prepared in RIPA lysis buffer SDS 0.1% supplemented with protease and phosphatase inhibitor cocktails (ROCHE). Nuclear and cytoplasmic extracts were prepared using the NE-PER kit (Pierce). Protein lysates were immunoblotted (see online supplementary table 6 for primary antibodies) and analysed with the Odyssey system (Li-Cor Biosciences). Before blotting, membranes were stained with SYPRO Ruby (Invitrogen) and scanned with the Molecular Imager PharosFX (Bio-Rad) for quantification of protein loading. Total RNA was extracted with Trizol (Life technologies). Reverse transcription was performed with 2 µg of total RNA and Maxima reverse transcriptase (Thermoscientific) with random hexamers. Quantitative real-time PCR was performed using the CFX96 Real-Time PCR Detection System (Biorad) with SYBR Green SuperMix (Quanta Biosciences). Primers sequences are shown in online supplementary table 7. The threshold cycle (Ct) value for each gene was normalised to the Ct value for rRNA18S, RPL0 and HPRT1 and relative levels of expression were calculated using Biogazelle Qbase+software. Gene expression profiles for fasted and refed control and Reptin Knock-out livers were analysed using Affymetrix Mouse Gene 1.0 ST arrays (see online supplementary information). Statistical analyses were performed using GraphPad Prism 5.0. The Mann-Whitney test was used for the comparison of means in experiments with two unmatched groups. One-way and two-ways analysis of variance followed by Bonferroni post-test were used for the comparison of means in experiments containing three groups or more and for the comparison of means in experiments containing three groups or more with different time points, respectively. We thank Daniel Metzger and Pierre Chambon for AlbCreERT2 mice; Daiichi-Sankyo (Japan) for the Reptin/Pontin inhibitor. Marianne Roda, Grégory Artaxet, Coralie Leroy and the staff of Bordeaux animal facility; Undergraduates students Lucas Toussaint, Anais Garnier and Sophie Barhouillet for their technical help; Nathalie Dugot-Senant and Alban Giese at the histology platform (University of Bordeaux, France); Philippe Zizzari for his help on metabolic cages data analysis; Nicolas Sorrhaindo and the Bichat Biochemistry platform (CRI, Paris, France) for plasma biochemical analysis; Sebastien Jacques, Florent Dumont and Franck Letourneur from the plateforme génomique (Institut Cochin, Inserm U1016, Paris, France); Aurelien Barre and Masha Nicolski (CBIB, Bordeaux) for their help in generating gene lists; UPenn vector Core facility (UPenn, USA) for AAVGFP and AAVCre plasmids; the Laboratoire de thérapie génique (Inserm UMR1089, Nantes, France) for the production of the AAV viruses; Violaine Moreau and all members of Inserm U1053 unit (BordeAux Research In Translational ONcolology) for helpful discussion; Fabienne Foufelle for kindly providing adenovirus encoding active SREBP1C; Raul V. Duran for helpful discussion on mTOR; Christine Perret, Anne-Françoise Burnol and Pascale Bossard for helpful discussion and critical reading of this manuscript.
. The multifaceted proteins Reptin and Pontin as major players in cancer. Biochim Biophys Acta 1815;2011:147–57.
. Inventors pyrazolone derivative having multiple substituents. Japan, 2015. Contributors SB-T and JR conceived and designed the study, analysed and interpreted the data. SB-T, JJ, N A-C collected and analysed the data. NS, PC, CH, CB, NP-L and FB participated in data acquisition. RP and MDC carried out the generation of Reptinlox/lox mouse model. PD, DC and CP contributed to the analysis of the data. SB-T, JJ and JR drafted the manuscript. All authors revised the manuscript and approved it. Funding This work was supported by grants from Inserm, la ‘Ligue Nationale Contre le Cancer’ (Equipe Labélisée Ligue Contre le Cancer 2011) and INCa (PLBIO10-155). JJ was a recipient of PhD fellowship from la Ligue Nationale Contre le Cancer (GB/MA/CD-11281). SB-T was supported by a grant from la ‘Fondation pour la Recherche medicale’ (FRM SFP20121226380). DC was supported by Inserm, Aquitaine Region and ANR-10-EQX-008-1 OPTOPATH. NS was supported by INSERM/Aquitaine Region PhD fellowship and FRM PhD fellowship FDT20150532545. CP is supported by grants from FRM (Foundation for the Medical Research, DEQ20150331744) and from National Agency for Research (ANR) (ANR-15-CE14-0026-Hepatokind). Ethics approval All procedures were carried out according to the French guidelines for the care and use of experimental animals and approved by the C2EA-50 University of Bordeaux Ethics Committee. Data sharing statement The additional data on human patients we provide in the revised version of our manuscript were generated from reanalysis of data available on Gene Expression Omnibus database.